In 4- to 5-quart Dutch oven, heat oil over medium heat. Add chicken pieces; cook about 5 minutes on each side or until browned (if necessary, cook chicken a few pieces at a time). Remove chicken from Dutch oven; set aside. In same Dutch oven, cook onion and bell pepper 3 to 4 minutes, stirring occasionally, until onion begins to brown; drain. Stir in tomatoes, garlic, curry powder, thyme, salt, ground red pepper and broth. Return chicken pieces to Dutch oven. Reduce heat to low; cover and simmer 30 to 40 minutes or until juice of chicken is clear when thickest piece is cut to bone (180°F). In 2-quart saucepan, heat water to boiling. Stir in couscous. Remove from heat; cover and let stand 5 minutes. 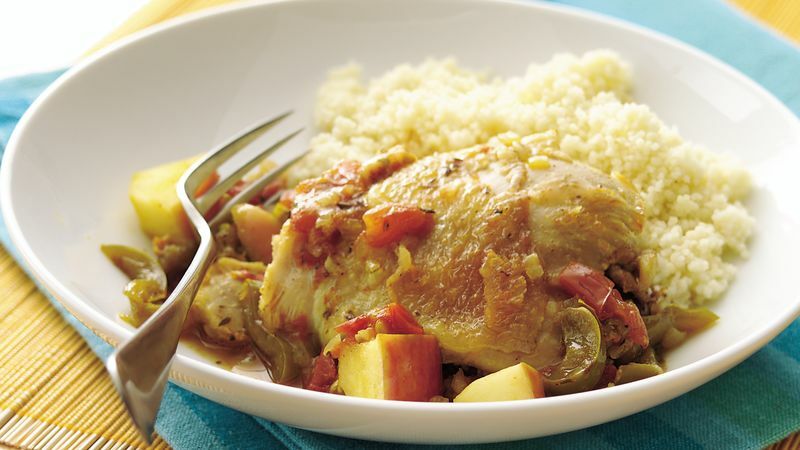 Stir apple into chicken mixture; simmer uncovered 2 minutes longer or until apple is hot. Fluff couscous lightly with fork before serving with chicken mixture. Couscous can be found near the rice section of the grocery store. It comes in a variety of flavors. For this recipe, use uncooked regular couscous.